With hundreds of wineries established throughout California, including dozens thriving in nearby Temecula Valley, San Diego enjoys a never-ending proliferation of wine bars stocked with the latest and greatest releases as well as varietals from across the globe. Numerous wine bars exist throughout the city’s LGBT neighborhood of Hillcrest, offering a quieter alternative to the cocktail-centric nightclubs. Among the most popular is Wine Steals, a University Avenue favorite that greets with an earthy, de-constructed interior as well as affordable wine choices from California and beyond. Its front sidewalk patio puts you in direct view of the gayborhood’s lively pedestrian flow. The bar is also famous for its creative selection of pizzas, many of them named after wine varietals. Further west and in walking distance is The Wine Lover, a quaint and intimate hangout that ranks as Hillcrest’s first wine bar. Finding a swell Napa Cab here for under $25 a bottle isn’t too difficult. The inventory focuses on small productions from notable family winemakers. Meat and cheese plates are also served and the space features a relaxing flora-filled patio. Residing a couple blocks away is Jake’s on 6th, where I’ve encountered some of the most well-structured Malbecs from South America, not to mention sensational “new world” whites from Sonoma and Oregon. The atmosphere at Jake’s is living-room comfy, featuring upholstered furniture, soft lighting and stone-façade accents throughout. The bill of fare extends to artisan cheese boards, paninis, salads and desserts. If you prefer pairing heartier meals to what’s sitting in your stemware, look no further than 100 Wines Kitchen, which captures a European farmhouse vibe amid a wine inventory spanning from bargain and special-occasion picks to prized small productions. In a short jot east of Hillcrest, in the gay-friendly neighborhood of North Park, customers dispense their own wine pours at Splash Wine Lounge. The artfully designed space features circular islands of shiny Enomatic machines from Italy that allow you to purchase one-ounce pours with prepaid cards. The system holds about 70 different labels and the actual bar features select bottles poured by human hands. Mosaic Wine Bar is another North Park favorite, given its industrial-designed panache and sturdy wine inventory boasting more than 200 choices. Fronted by a sizable patio, it also offers a lengthy food menu and a popular weekend brunch featuring all-you-can-drink sangria. San Diego’s largest wine bar (and perhaps the biggest in the nation) is the art-filled Fifty Seven Degrees Warehouse, located centrally in Middletown near the western foot of Washington Street. Formerly a Pier I Imports store, the structure showcases a plethora of colorful works from local artists as well as a massive inventory of niche wines hailing from the U.S. and abroad. If you’re a fan of South American wines and the gourmet dishes that go with them, Wet Stone Wine Bar & Café in nearby Bankers Hill is your ticket to Tannat from Argentina and Carmenere from Chile. The wine list doesn’t exclude coveted labels from California and Europe or tropical house-made sangrias that wink at you from glass vats on the bar. If you find yourself shopping or sunning in Ocean Beach, the 3rd Corner Wine Shop & Bistro serves as an excellent finale to the day with its teaming wine selection strewn throughout a large retail section that doubles as a restaurant. From new releases to older vintages, you’ll find them within this formidable bottle collection before digging in to such dishes as seafood risotto, wild mushroom pasta and a stellar execution of duck confit. 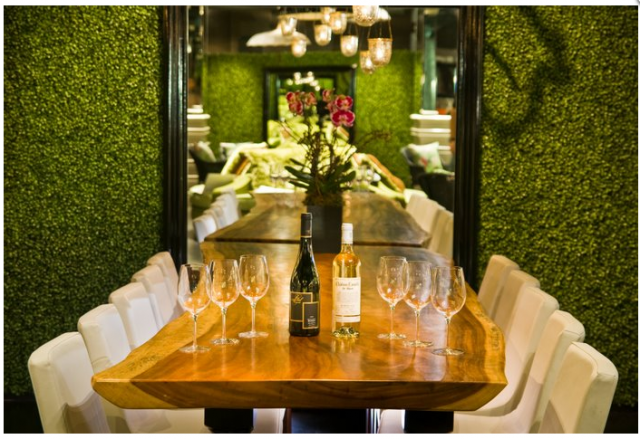 Lastly, when the urge for vino strikes while romping through the bustling Gaslamp Quarter, I duck underground into Vin de Syrah, a subterranean wonderland of sorts where botanical chandeliers and old wine vines hover over plush sitting areas. The eccentrically styled establishment attracts a diverse crowd and offers a focused selection of wines by the glass, a majority of them from top California vineyards. It’s one of the few wine bars in San Diego that also serves cocktails, so don’t hesitate to bring along your vodka-loving friends. This entry was posted in Culinary by Frank. Bookmark the permalink.